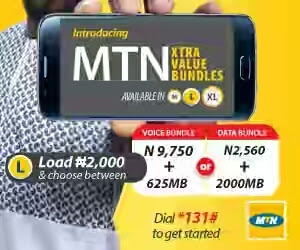 Recalled our previous article was centred on mtn XtraValue, and we told you the bundle plan is actually of two, which are the XtraTalk and of course Xtradata, well here it promises to be full gist, on each of this two plans, and why we think its a plan that get you more value for your money. Kindly relax, take a cold zobo or fanta, better still any drink you like be it palm wine or water, just take something cold, and go along with us. And it also valid for 7days (one week). Recommended : see the best mtn Tariff plan you never knew existed. Another plan on the mtn XtraTalk is that of #1000, using this Plan you get an airtime Worth N3,875 for voice calls and data Data package of 312.50MB. You see why I said you get more value, in face real value for every of your recharge, every plan you opt in for on the XtraTalk is a bomb. MTN XtraData Bundles, Unlike its other half (Xtra Talk), xtradata offers more data value than voice call. My guess thou is that this plan were specially designed for various individuals, be it you love to call, or yours is to surf the whole of Africa on net. Just like the its other half, the mtn xtra data as nearly similar plans with is former, but this time more emphasis is on data than of call, for example, with #300 using the mtn xtra data you get a data of about 150mb, with an additional #372 for calls, Without wasting much of your time, a quick look at the mtn xtra data bundle plan. There you have it all, you can now decide on which of this mouth watering mtn bundle plan you want to rest your head on. But then tell us what you think about this plan, do you think they are good enough or not close? Feel free, air your voice via comment.